We’d love your help. Let us know what’s wrong with this preview of Focused by Alyson Gerber. Clea can't control her thoughts. She knows she has to do her homework . . . but she gets distracted. She knows she can't just say whatever thought comes into her head . . . but sometimes she can't help herself. She know she needs to focus . . . but how c Following Braced, which had three starred reviews, comes a story of a girl caught between her love of chess and her ADHD. It's starting to be a problem—not just in school, but when Clea's playing chess or just hanging out with her best friend. Other kids are starting to notice. When Clea fails one too many tests, her parents take her to be tested, and she finds out that she has ADHD, which means her attention is all over the place instead of where it needs to be. To ask other readers questions about Focused, please sign up. Clea felt like she was failing at EVERYTHING! She was messing up her class assignments, hurting her friends and family - she just couldn't seem to do anything right. After a string of poor grades, her parents had Clea tested and discovered that she has ADHD. Now that she had an explanation for why these things were happening, would Clea be able to repair all the damage she had done? Maybe it's because Gerber is writing from experience. Maybe it's just because she's a great writer. Whichever the case, I must say, that Gerber is so good at writing this type of story. I loved Clea so much, and my heart went out to her as she was trying to adjust to her new normal. Gerber did an incredible job capturing her emotional ups and downs. First, as Clea was trying to deal with her lack of focus and impulse control, and later as she was coming to terms with her diagnosis and trying to learn to navigate her needs and advocate for herself. I really thought this part was handled wonderfully, and I thought it was important that we saw Clea's successes and setbacks. I also liked that we saw how Clea's ADHD affected those around her. Clea generally was a wonderful friend and sister, but there were times, when her lack of impulse control got her into trouble. There was one friendship rift, that broke my heart. I liked that Clea never tried to use her ADHD to excuse her behaviors, but rather, as she learned more about her disability, she became more cognizant of her behaviors, and utilized the techniques the doctor equipped her with to curb the interrupting and blurting out, which was causing the friction between herself and her loved ones. Another thing I thought was great, was how Gerber took us through the whole process - identification, testing, diagnosis, and treatment. There was quite a bit of good information relayed in the book, and it was worked into the story in a very organic way too. She also showed, that being neurodivergent didn't mean you were broken. It meant that your brain just worked differently. I was really proud of Clea, when she figured out what she needed to succeed. Not only did she figure out what she needed, but she was very mature and asked for these accommodations when necessary. It's so important that people understand they should feel no shame asking for things that will help them succeed. • Clea's friendship with Sanam was really special. They bonded over their love of chess, as well as over their mutual learning disabilities, and Sanam was such a positive force in Clea's life as well. Loved her! • I never really played chess seriously, but I was so intrigued by all the chess stuff in this book. Gerber was able to transfer some of Clea's excitement to me, which I thought was great. • There's a little touch of romance in the story, which was so, so sweet and cute and I loved it. • Clea's little sister was a precious little star. The kid was able to bring happiness to every page she popped up on. This book was heartwarming and informative. I think it would be a valuable read for a young person trying to come to terms with their own ADHD diagnosis, as well as for those, who love them. ⭐⭐⭐⭐⭐/5 for FOCUSED by @alysongerber, which doesn't come out until 3/26/19. Big thanks to Alyson and @scholasticinc for sharing this ARC with me (and #kidlitexchange) for review purposes. All opinions are my own. Clea is gifted at chess, a good friend and an excellent big sister to Henley, who struggles with a communication disorder. Oh, and Clea also has problems focusing and it's starting to have a serious impact on her work. #focusedthebook is the story of a middle grade girl discovering th ⭐️⭐️⭐️⭐️⭐️/5 for FOCUSED by @alysongerber, which doesn't come out until 3/26/19. Big thanks to Alyson and @scholasticinc for sharing this ARC with me (and #kidlitexchange) for review purposes. All opinions are my own. Clea is gifted at chess, a good friend and an excellent big sister to Henley, who struggles with a communication disorder. Oh, and Clea also has problems focusing and it's starting to have a serious impact on her work. #focusedthebook is the story of a middle grade girl discovering that she has ADHD...which brings up many emotions and only complicates her life further. Should she go on medication? Can she learn to control her emotions and stop blurting things out? Clea is a smart student who is drowning in assignments and confused about whether she even has ADHD -- how could it have been missed for so long? I can't think of another middle grade book out there that goes so deep into the thoughts and emotions of someone who struggles with ADHD. This #ownvoices book has the potential to help kids who have ADHD understand themselves better and will also illuminate the struggle of ADHD for others. FOCUSED addresses misconceptions about ADHD, as well as the gifts associated with it like hyper focus on preferred topics. . Note: I received an ARC of Focused via a book sharing group in exchange for my honest review. Author Alyson Gerber uses her own experiences with Attention Deficit Hyperactivity Disorder (ADHD) to portray Clea's struggles in school and with relationships with friends and family. Clea's passion is chess, but her struggles elsewhere impact her playing too. While I enjoyed Focused, I also found it a touch long for the message and I had grown a touch weary of Clea. The novel started to feel contrived Note: I received an ARC of Focused via a book sharing group in exchange for my honest review. While I enjoyed Focused, I also found it a touch long for the message and I had grown a touch weary of Clea. The novel started to feel contrived and just a vehicle to teach the reader more about ADHD, which I'm not sure young readers will appreciate. I also found the suddenness of Clea's struggles unbelievable, as well as how tidily everything gets wrapped up. In Alyson Gerber’s first novel Braced, readers were given the opportunity to learn the story of Rachel Brooks, a middle grades student who has scoliosis but also who has persistence and resilience. Rachel learns to re-see herself and her strengths, and she provided, for many readers, a mirror to their lives and the chance to see themselves and their struggles valued in a novel. And maybe more importantly, Braced gave readers who have not had to face such challenges an awareness, empathy, and und In Alyson Gerber’s first novel Braced, readers were given the opportunity to learn the story of Rachel Brooks, a middle grades student who has scoliosis but also who has persistence and resilience. Rachel learns to re-see herself and her strengths, and she provided, for many readers, a mirror to their lives and the chance to see themselves and their struggles valued in a novel. And maybe more importantly, Braced gave readers who have not had to face such challenges an awareness, empathy, and understanding for those who do. In the same way, Gerber’s new novel Focused shares the story of Clea Adams, a seventh grader who has ADHD (attention-deficit/hyperactivity disorder). Clea works as hard as she can on her schoolwork but just cannot seem to complete all the tasks; she doesn’t always follow directions, finish assignments, or remember what she needs to do. She feels that she isn’t trying hard enough or isn’t smart enough to achieve. She is also affected socially as she blurts out whatever she is thinking, interrupting conversations and sharing the secrets of others. Luckily, on the plus side, she has a best friend Red, a new girlfriend Sanam, a supportive family, and she is really good at chess, which she loves. Chess is the one activity where she seems to be able to focus. But when her lack of focus and impulsivity cause her to lose her friendship with Red and possibly forfeit her chance to remain on the chess team, Clea needs to take action. She is tested for ADHD and learns that it is her condition that controls her actions, rather than lack of intelligence or willingness to support her friends. Clea is a middle grade student who has a passion for chess but is struggling with her school life. No matter how hard she tries she cant seem to complete assignments on time or properly. She has difficulty staying organized and she has on more than one occasion blurted out comments that have impacted her relationships with friends and members of her chess club. This struggle to stay on top of everything Note: I received an ARC of Focused via a book sharing group in exchange for my honest review. Clea is a middle grade student who has a passion for chess but is struggling with her school life. No matter how hard she tries she cant seem to complete assignments on time or properly. She has difficulty staying organized and she has on more than one occasion blurted out comments that have impacted her relationships with friends and members of her chess club. This struggle to stay on top of everything has come to the attention of her parents who decide to have her tested for ADHD. Once diagnosed Clea gains an understanding of her strengths and challenges and begins her own journey of how to not only live but thrive with her condition. This should be required reading for teachers of middle grade readers. As she did with Braced, this author has raised my awareness of an issue (this time it is ADHD) by providing me with a window (term from Dr. Simms Bishop) into the life of a typical middle school student. Her discriptions of needing quiet, time management, and organization will stay with me for a while. The information shared about this diagnosis brings much needed information to readers. Oh, I so adored this. Gerber perfectly captures the mind of a girl with ADHD and balances it so well with Clea’s family and friend struggles. I love the supporting cast, too. If you are a middle school teacher, you will want this book for your classroom library. FOCUSED, by Alyson Gerber, is an important and engaging middle grade novel that addresses what it’s like to have ADHD. The story is told from the perspective of Clea, a 7th grade girl, who loves to play chess, but struggles with focusing on her school work. She has a kind heart as readers see by the way she adores her younger sister. However, friendships and academics start to go down hill fast, as she can’t If you are a middle school teacher, you will want this book for your classroom library. 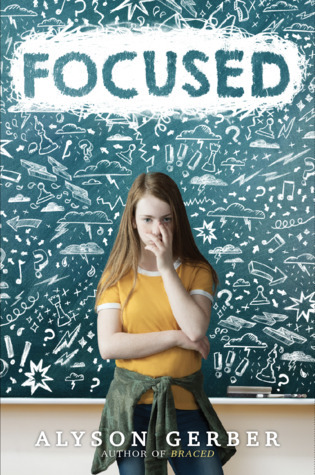 FOCUSED, by Alyson Gerber, is an important and engaging middle grade novel that addresses what it’s like to have ADHD. The story is told from the perspective of Clea, a 7th grade girl, who loves to play chess, but struggles with focusing on her school work. She has a kind heart as readers see by the way she adores her younger sister. However, friendships and academics start to go down hill fast, as she can’t seem to control her impulses and, sometimes, says things that maybe she shouldn’t. As a middle school reading teacher, I am so happy that there is a book like this for students. It is important that students who have ADHD see a character similar to them in books and see how that character overcomes her struggles. For students without ADHD, it is important for them to experience the challenges that others face, so they can understand and empathize. Thank you to Alyson Gerber for sharing a review copy of Focused with Collabookation. Clea is falling behind in all of her classes, and it isn't for lack of trying. She finds herself constantly playing catchup, but when she sits down to work, she perseverates on the sounds around her or her latest mistake. After some evaluations and observations, Clea learns that she has ADHD. So begins a book in which Clea must learn how to be herself when that can often be a challenging task. Alyson Gerber grew Thank you to Alyson Gerber for sharing a review copy of Focused with Collabookation. Alyson Gerber grew up with the difficulties of ADHD before she knew what it was called, and we are lucky for that. Gerber beautifully, albeit sadly, captures the feelings of struggle, failure, and isolation a middle schooler with ADHD may experience. Clea works hard, but it never seems to be enough. Clea's saving grace is her strong support network: her family, friends, teachers, and doctors. No one in Clea's life says her path will be easy, but everyone acknowledges her efforts to do well, academically and socially. In Focused, Clea learns that we only lose when we give up on ourselves. Having not experienced ADHD myself I appreciated this middle grade novel about Clea, a middle school student struggling to mange her increasing workload amid her inability to avoid distractions and stay on task. Clea is eventually diagnosed with ADHD and must come to terms with her condition and work out how to handle her school work. Through intervention from a compassionate doctor, a helpful school advocate, dedicated parents, and medication, Clea begins to feel hope for her future. I am so grateful to Alyson for sending me a copy of her upcoming book, FOCUSED (March 2019). I really loved her debut book, BRACED, about a middle school girl who needs to wear a back brace to manage scoliosis. Alyson wrote from the heart based on her own experience, and when I heard FOCUSED was also inspired by her real life challenges with ADHD, I was anxious to read it. .
What I loved about this book: Clea is having trouble in school, which is impacting her passion for chess. If she can’t keep I am so grateful to Alyson for sending me a copy of her upcoming book, FOCUSED (March 2019). I really loved her debut book, BRACED, about a middle school girl who needs to wear a back brace to manage scoliosis. Alyson wrote from the heart based on her own experience, and when I heard FOCUSED was also inspired by her real life challenges with ADHD, I was anxious to read it. .
What I loved about this book: Clea is having trouble in school, which is impacting her passion for chess. If she can’t keep her grades up, she’s going to be kicked off the school team, but chess is the only thing she feels she’s good at. As the book progresses, Clea is diagnosed with ADHD, and starts treatment for it. Add the struggles of having a best friend who reaches a breaking point with Clea’s behaviour that neither of them understand, as well as the usual challenges of middle school, and you have the plot for an excellent story. Clea tries so hard, wants so much to be able to focus, and carries a large weight of blame that she just can’t get her act together. It’s the detailed look at her feelings about how ADHD makes her feel that most appealed to me about this story. TEACHERS: This is a really good one to share with your students!! WOW is what I thought of this book. Never have I ever read a book that helps me “feel,” emotionally, what ADHD does to a child. The frustration, the anxiety, and the insecurity. I could hear the voices of my students who struggle with ADHD. Not only that, but MC Clea isn’t just her diagnosis. She has an activity she loves, a best friend who is struggling with trauma and grief, and a mean girl who had targeted Clea in her bullying. Such a well-rounded book with well-developed characters and a plo WOW is what I thought of this book. Never have I ever read a book that helps me “feel,” emotionally, what ADHD does to a child. The frustration, the anxiety, and the insecurity. I could hear the voices of my students who struggle with ADHD. Not only that, but MC Clea isn’t just her diagnosis. She has an activity she loves, a best friend who is struggling with trauma and grief, and a mean girl who had targeted Clea in her bullying. This book left me exhausted and feeling so much sympathy for my students who struggle with focus issues. I consider myself pretty well informed and I try my best to help all students, but this book showed areas where I'm clearly doing the exact wrong thing and gave some good suggestions for better responses on my part. This book brings to light important issues for school aged kids. Time and again we hear how important it is to read parts of ourselves reflected in literature; it creates solidarity and understanding for kids coming of age. Alyson is a rockstar writer! A fantastic middle grade read about what it’s like to be diagnosed with ADHD and how to manage it. Focused is a honest and authentic story about seventh grader Clea and her experience being diagnosed with ADHD. From the very first page, it is clear that Clea struggling to keep up with her schoolwork. She can’t concentrate when taking a quiz and leaves answers blank. When completing homework, she finds it hard to manage her time which results in incomplete assignments. Chess is Clea’s passion and if her grades slip, her opportunity to be on the chess team is in jeopardy. Adding more fuel to th Focused is a honest and authentic story about seventh grader Clea and her experience being diagnosed with ADHD. From the very first page, it is clear that Clea struggling to keep up with her schoolwork. She can’t concentrate when taking a quiz and leaves answers blank. When completing homework, she finds it hard to manage her time which results in incomplete assignments. Chess is Clea’s passion and if her grades slip, her opportunity to be on the chess team is in jeopardy. Adding more fuel to the fire, her best friend Red dealing with his own family issues is tired of all of Clea’s impulsive outbursts. Drawing on her own experience having ADHD, Alyson Gerber wrote Focused from Clea’s point of view. I love that readers get a first hand account of Clea’s thoughts and feelings. Initially, Clea puts all the blame on herself and thinks if she just works harder, things will improve. After testing and an official diagnosis, Clea learns that she is capable and intelligent and having ADHD has actually made her more persistent and willing to get back up when she does have a set back. With her new found knowledge and a plan to treat and manage her ADHD, Clea can be in control and begins advocating for herself. Loved this book! If you know anyone with ADHD this book is a must. And if they don't have ADHD they need to read this to understand that not everyone functions the same way. It will make them more empathetic towards others. This book was powerful. It felt real and was a fabulous plot filled with friendship, school problems, chess and compassion. Wonderful! Oh, how I loved this book! She is such a great author. This book will be so powerful for kids who have ADHD to read. And at the same time offer a window into what it may feel like to have ADHD - important for young readers and those who care for and work with kids who have this to read. From the first page, I felt transported in Clea's world. I felt her stress, her distraction, her confusion, and her desire to be a responsible student and friend. I lived her story. Alyson Gerber does a masterful job at crafting Clea's experience in a way that the reader experiences it as well. As a teacher, I have more empathy after reading this book. I wonder how many students are like Clea, but I only see the disorganization or confusion. I think this book will be powerful for students with A From the first page, I felt transported in Clea's world. I felt her stress, her distraction, her confusion, and her desire to be a responsible student and friend. I lived her story. Alyson Gerber does a masterful job at crafting Clea's experience in a way that the reader experiences it as well. As a teacher, I have more empathy after reading this book. I wonder how many students are like Clea, but I only see the disorganization or confusion. I think this book will be powerful for students with ADHD to read because as Clea learns to come to terms with her condition, she uses great tools to help her succeed. I also think this book is just as valuable for students without ADHD to have a better understanding and compassion for those struggling in their own lives. Loved this book! Really gives you an idea of what is happening in the mind of someone with ADHD. Clea has always been a good student, but 7th grade is proving especially difficult. She just can’t seem to get organized enough to get her homework done on time, and she seems to have trouble controlling her need to blurt out whatever she’s thinking. Her parents think she needs to be tested for ADHD. Gerber’s middle grade novel, told in first person reads as frantic as Clea is feeling. A great empathy experience for the teen reader. Focused by Alyson Gerber, 304 pages. Scholastic, April 2019. $17. Clea can’t concentrate. If she can’t concentrate, she can’t get her homework done. And if she doesn’t get her homework done, she’ll be on academic probation and she won’t be able to go to nor compete with the school chess club. She may have started going to please her best friend Red, but now she goes because she loves it. Unfortunately, Clea also can’t keep her mout Focused by Alyson Gerber, 304 pages. Scholastic, April 2019. $17. Clea can’t concentrate. If she can’t concentrate, she can’t get her homework done. And if she doesn’t get her homework done, she’ll be on academic probation and she won’t be able to go to nor compete with the school chess club. She may have started going to please her best friend Red, but now she goes because she loves it. Unfortunately, Clea also can’t keep her mouth shut – and one day she wounds Red with her words - - at a time when she needs Red and Read really needs her. IS there something wring with Clea – could she really be one of those ADHD kids who need medication? Watching Clea at the beginning of the book as she navigates her world with her ADHD brain is eye-opening as a teacher. I know that Gerber has had to severely simplify the struggles of someone coping with ADHD and trying out possible treatments and medications. I can almost forgive the author for how simplistic the whole thing seems – how much a miracle it appears. Because the kids I see struggling around me – their answers don’t seem to come that easily. Valuable still, to see the world through different eyes. My students love realistic books that are truly about life without tons of exaggerations. They like to see themselves in the books they read. Braced did that and so does Focused. I'll admit, however, I liked Braced more because it deals with a popular sport. This book does an excellent job of capturing what it feels like to have ADHD. I have no doubt that kids who have it are going to say, "That's me!" and kids who know people with it are going to say, "Now I get it." Definitely a book for every My students love realistic books that are truly about life without tons of exaggerations. They like to see themselves in the books they read. Braced did that and so does Focused. I'll admit, however, I liked Braced more because it deals with a popular sport. This book does an excellent job of capturing what it feels like to have ADHD. I have no doubt that kids who have it are going to say, "That's me!" and kids who know people with it are going to say, "Now I get it." Definitely a book for every school library. The part I'm hedging on is the Chess part. I have several reasons. 1) Chess teams are rare in schools, especially middle school. This books makes it seem popular. 2) I don't know any kids who play Chess and certainly none who will ask for books about Chess, whereas sports books...all the time. 3) The author doesn't mention Chess at all in the Afterword, so I assume she did not play it as a kid. I don't get how Clea found Chess. It would have felt more authentic to me if she had discovered it after she was diagnosed with ADHD, as a therapy. Thanks to the @kidlitexchange network for the review copy of this book. All opinions are my own. From the author of Braced, which sheds light on scoliosis, comes Focused - a middle-grade novel about ADHD. The main character, chess-obsessed Clea, has been struggling with school and her relationships with others. When she is diagnosed with ADHD, her life slowly begins to change as strategies are implemented to help her find ways to concentrate and manage her school work and daily tasks. Clea is a well-crafted character whose seventh-grade challenges (homework, friendship issues, bullies, and first crushes) are relatable and believable. The first-person narrative gives the reader unique insight into her thought processes as she struggles with her ADHD, and juggles academic and social pressures. Readers will become cheerleaders - wanting Clea to try, try, and try again to strive for her goals and dreams. children's middlegrade fiction - girl with ADHD (#ownvoices) struggles with schoolwork in 7th grade, gets tested for ADHD and finds that medicine helps her (she also competes in her chess club, makes new friends, and argues with her existing friend. this book pretty much serves the one purpose - teaching kids about ADHD and helps those with the condition to cope and not feel alone - but it does a pretty good job and does fill that need. The medication part is simplified (there is one option offer children's middlegrade fiction - girl with ADHD (#ownvoices) struggles with schoolwork in 7th grade, gets tested for ADHD and finds that medicine helps her (she also competes in her chess club, makes new friends, and argues with her existing friend. Alyson wore a back brace for scoliosis from the age of eleven to thirteen, an experience that led directly to her debut novel BRACED. BRACED received three starred reviews and a Junior Library Guild Selection. It has been nominated for the 2019 Oklahoma Library Association’s Sequoyah Book Award, the 2019 Indiana Library Library Federation’s Young Hoosier Book Award, and the 2019 New Hampshire Libra Alyson wore a back brace for scoliosis from the age of eleven to thirteen, an experience that led directly to her debut novel BRACED. BRACED received three starred reviews and a Junior Library Guild Selection. It has been nominated for the 2019 Oklahoma Library Association’s Sequoyah Book Award, the 2019 Indiana Library Library Federation’s Young Hoosier Book Award, and the 2019 New Hampshire Library Association’s Isinglass Teen Read Award. Alyson’s new middle grade novel FOCUSED, about a girl caught between her love of chess and her ADHD, will be in stores on March 26, 2019! FOCUSED received a starred review from Kirkus Reviews and a Junior Library Library Guild Selection.